Tonight the Chicago Bulls (3-3) and the Orlando Magic (3-3) tip-off for the first of four times this season. The Magic come into the United Center feeling confident and riding a positive wave after posting three straight victories, while the Bulls find themselves on the opposite side of the spectrum, having run out to 3-0 start only to lose the next three games on their schedule. In Chicago’s three opening victories, the Bulls stampeded to quick starts, outscoring opponents 92-60 in the opening quarter. Chicago then went on to average 113.7 points, 28.3 assists and just 14.7 turnovers while allowing a paltry 96 points per game. However, over the last three contests – each an ugly and frustrating loss – opponents have turned the tables, outscoring Chicago 99-63 in the first quarter, averaging a whopping 111.7 points per game while Chicago staggers to 99.3. The exciting quick pace and unselfish ball movement the Bulls employed at the start of the season has also evaporated into thin air, as they have averaged a very uninspired 17.7 assists (down 10 per game) while mishandling the ball more often to a rate of 16.7 turnovers over the last three games. It definitely won't be an easy task for Chicago to right the ship this evening against the Magic. Saturday night Orlando defeated Washington, 88-86, thanks in large part to a strong effort off their bench. Veteran forward Jeff Green scored 18 points in his new reserve role, while free agent signee Bismack Biyombo added nine points, 12 rebounds and three blocked shots, and ex-Bulls point guard D.J. Augustin chipped in seven points and five assists. More importantly, Orlando really tighten the screws defensively with a number of key stops late in the fourth quarter, holding the Wizards to just 16 points on 5-of-22 shooting (22.7 percent) from the field. 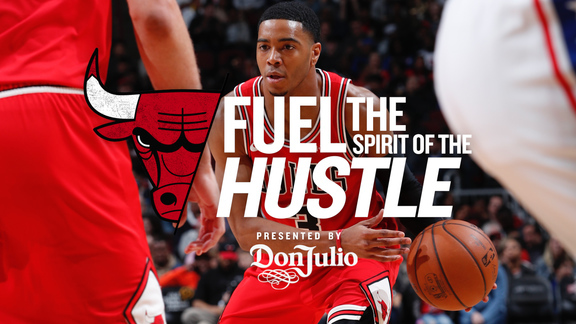 In order for the Bulls to get back on track they’ll need to rededicate themselves to going all out, out-hustling and out-working Orlando in every imaginable way. One of the keys to Chicago’s quick start was the team’s scrappiness at both ends of the floor. Defensively, Chicago needs to get back to having an aggressive, nasty mindset. They simply cannot allow the Magic easy scoring opportunities. Every shot and pass they attempt must be challenged. Another major key for the Bulls is their willingness to crash and take command of the boards. Chicago comes into this evening ranking 2nd in the league in overall rebounding (48.5 per game). The Bulls have been especially effective on the offensive glass, leading the NBA with an average of 14.5 offensive boards per game. Overall, they are out-rebounding foes by 10.3 boards and outscoring them in second-chance points 86-49 (an average of 14.3 points per against 8.2). However, tonight’s opponent, the Orlando Magic, also does a terrific job on the glass, and ranks second behind the Bulls in offensive rebounding (12.7 per game). Orlando has also put forth a yeoman’s effort when it comes to notching second-chance points, as they lead the league with a mark of 17.8 per game. Offensively, Chicago has to get back to quickly pushing the ball up the floor and make it hop from player-to-player, and side-to-side. With one of the NBA’s top point guards (Rajon Rondo) behind the wheel, it’s frankly a disservice if the Bulls slow the pace by repeatedly walking the ball up the floor and then fall into a trap of playing an isolation, one-on-one game. The ball cannot get stuck in anyone’s hands for too long. It needs to be shared freely while everyone constantly moves about, cutting towards and away from the basket with a purpose. The Bulls can’t simply live outside and launch jumpers. As a collective unit, they need to attack the rim and force Orlando to scramble and expend extra energy at the defensive end of the floor. Overall, Chicago has done a nice job of getting to the free throw line, and cashing in this season. The Bulls have hit 20+ free throws in each of their last three games, and in four of the first six, which has led to them outscoring opponents, 124-73, at the charity stripe. In particular, Jimmy Butler has been outstanding, leading the team with an average of 7.8 free throw attempts per game, which ranks 10th in the league. In total, Butler’s hit 41-of-47 from the stripe, an impressive .872 clip. Without a doubt, the NBA schedule has not done the Bulls any favors. Tonight marks Chicago’s fifth game in seven days, with three more (two on the road) on tap the rest of this week. However, the task at hand is to somehow get back to posting victories, and in order to do that this evening Chicago has to dig deep and come out fast and strong from the jump. The Bulls have to up their overall intensity, especially defensively, by being hardnosed, blue collar and smart. They need to do a far better job of recognizing and executing the proper defensive rotations, especially when Orlando looks to employ the pick-n-roll game. Offensively, the Bulls have to play faster and get back to sharing the ball. They need to make the game fun again by crashing the boards and getting out on the break as often as possible, and also find the open man by making the extra pass.